Japan is already known for its technologically-advanced toilets that offer seat warmers, sound systems and other cutting-edge features, but Panasonic Corp. may have created the greenest throne of them all. According to Pursuitist.com, Panasonic has created the Arauno V, a tankless toilet that will open up space and connect directly to a home's water supply. The Arauno V is ideal for cramped urban bathrooms and other smaller washrooms that could use any available space. Panasonic believes that the device is ideal for apartments in the upper stories of buildings where water pressure can be lower. The toilet is constructed from organic materials to limit its impact on the environment. Best of all, it will use far less water than conventional designs. "Tankless, water-saving toilets with attractive designs are designed to be easy and comfortable to use and environment-friendly and bring about a new lifestyle for users," the company told the news source. While toilet technology is slowly catching up in the United States, the country is still lagging behind in green bathroom advances. 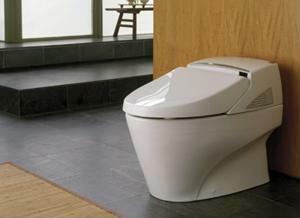 The company has no plans to bring the Arauno V to the U.S. quite yet, but if it was available, would you invest in this eco-friendly toilet?